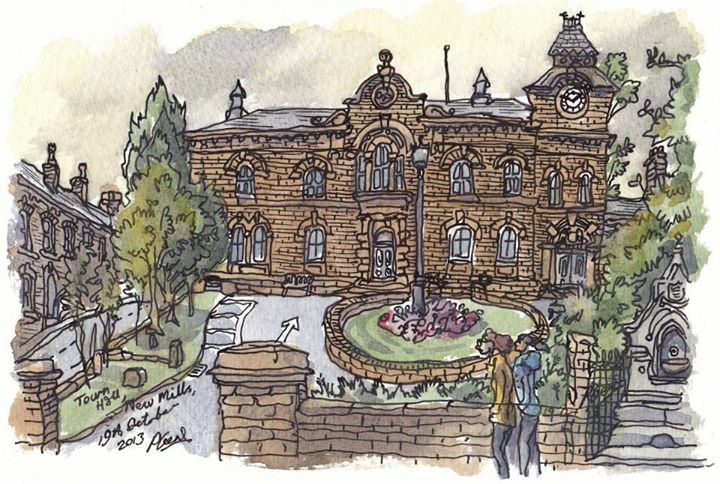 Situated in the High Peak and on the edge of the Peak District National Park with easy access via train or car from Sheffield and Manchester, New Mills Town Hall could be the ideal venue for your wedding, event or conference. The Town Hall is a large attractive stone building dating back to 1870 retaining most of its original exterior architectural features. It is set within the New Mills conservation area on an elevated site with a panoramic views of the High Peak countryside including the famous Kinder Downfall. It is a working Town Hall which includes the main office of the registration service for the High Peak and is licensed to carry out wedding ceremonies, New Mills has many photogenic areas for taking wedding photographs, in particular The Torrs Riverside Park which is a five minute walk from New Mills Town Hall. The main hall is attractively decorated in blue and white with a wooden floor and large arched windows which provide ample natural light in addition to the beautiful view. It is situated on the first floor of the building with level access from a designated disabled car park and includes disabled toilet facilities. In addition the hall is equipped with a large cinema style projector screen, portable projector screen, radio mike PA system and hearing loop. Whether you wish to bring in external catering for an event or provide it yourself, the Town Hall has a well equipped kitchen with a large electric hob and oven, a mains hot water urn and sufficient cups and saucers for two hundred people. For smaller events the library lecture room may be more appropriate as it is designed to seat 60 people or alternatively 40 seated at tables. The room measures 11m x 6m and comes equipped with a projector screen and hearing loop. It is adjoined by the kitchen so is ideal for small conferences, training events, presentations or celebration parties. Please note however that the lecture room is not wheelchair accessible. The council chamber is the formal room where council meetings are held but is also licenced as a wedding ceremony venue for up to 30 people. It is very tastefully decorated with original oak and leather furniture, plush red carpet and artwork of local interest and is therefore ideal for more intimate smaller groups. The administrator and on-site caretaker are happy to meet with you in advance of your event to discuss your requirements and the services that we can offer. All seating and tables are provided, with set up by the caretaker included in the hire cost. 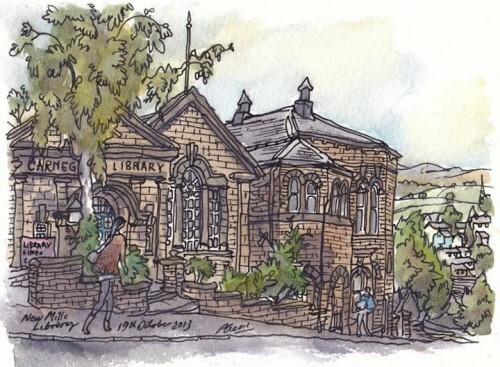 At New Mills Town Hall we will always endeavour to ensure that your event runs as smoothly as possible and will therefore provide you with a point of contact right from the planning stage in case your requirements should change beforehand. In addition the caretaker is always on hand during events to provide any assistance you might require in setting up and to ensure that everything runs according to plan. Phone: Registrar – 01629 533686 to register a birth or marriage.